We were lucky. Our room was on the fifth floor, the window was large and rose from the floor to the ceiling. From the bed, we had a great view of the Parliament building, Big Ben, the River Thames and Westminster Bridge – perfectly framed by the left side of the window and the perfect size for my picture. The slow, large hour and minute hands wandered over the clock face of Big Ben. The rain fell incessantly in the city, which had a dull, diffuse light. Automobiles, black taxis and red double-deckers crawled over the wet sparkling asphalt and people rushed under umbrellas on the bridge, whilst I was sitting comfortably on my bed. With my back against the wall, I peered into the distance and deepth and discovered brushstroke by brushstroke the picturesque ensemble that spread out before me, while the time passed by and the sky slowly cleared up. 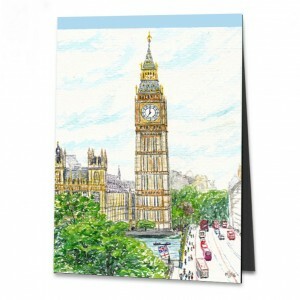 “Big Ben is leaning somewhat…” Helga noticed straight away when I got home and showed her my picture. “But that does not matter,” she added, “is art not a matter of interpretation anyway and always depends on the perspective of the artist?" – “That’s right.” I agreed with her and thought to myself quite amused how nice it was sitting on this nice bed next to this large window, and how my wonderfully comfortable but evidently unbalanced sitting position impacted ‘my’ Big Ben.